Handmade wedding ceremony arbor made of bamboo and white exotic flowers. 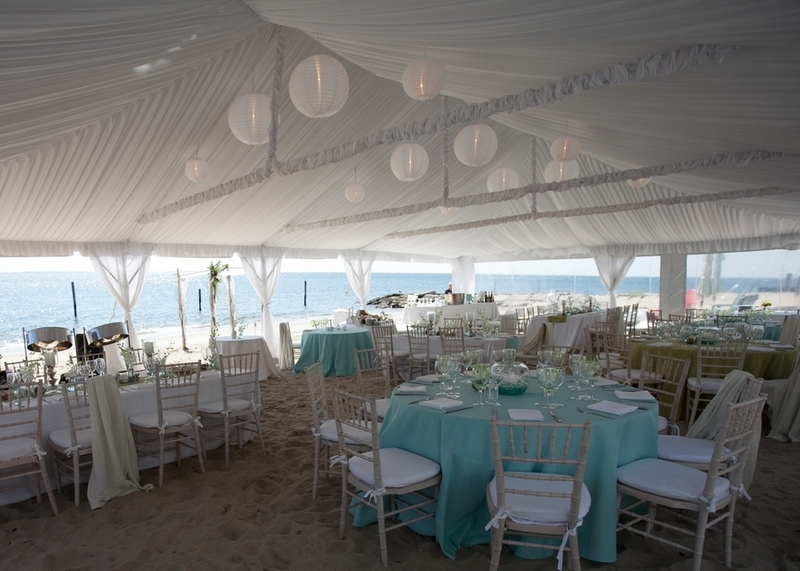 Silk-lined tent strung with festive white paper lanterns. Provided by CT Rental Center in Middletown, CT. 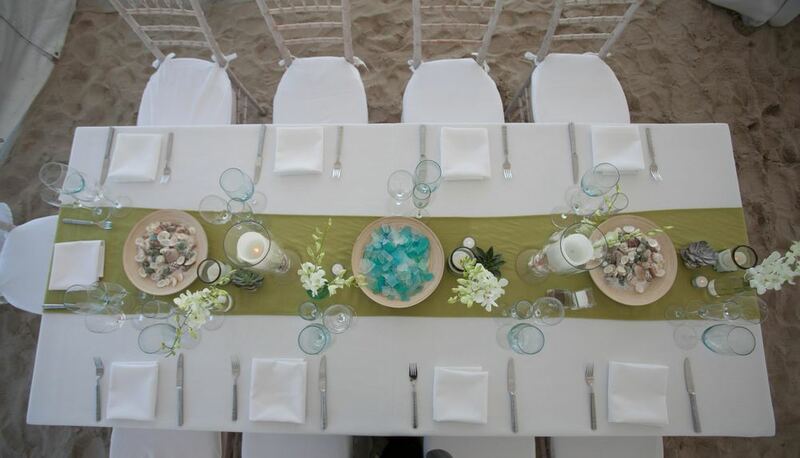 Guest tables set with linens in summer white, chartreuse green and aqua blue. Surrounded with raw wood chivari chairs. Linear tablescape of vessels with natural sea shells and sea glass, and artisan glassware. 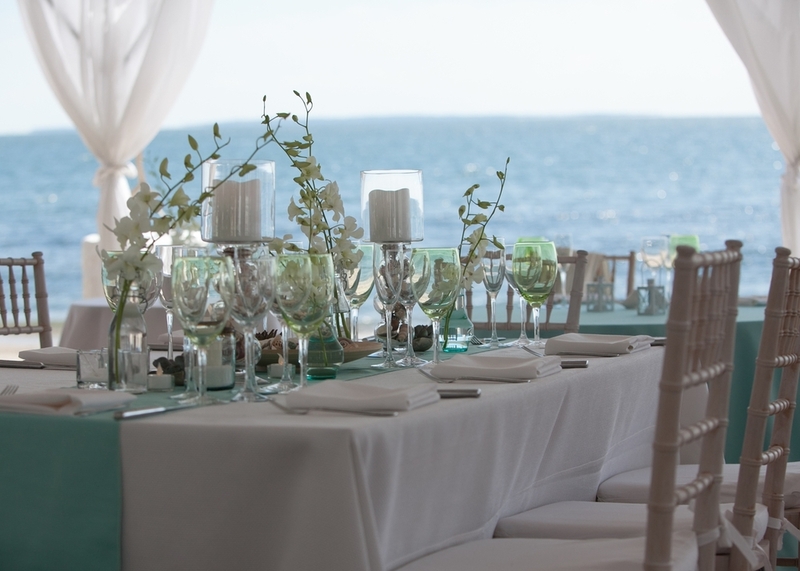 Glass bowls containing white floating orchids on bed of sea glass surrounded by mini white cottage style lanterns. Lounge and bar area complete with white leather love seats and chartreuse green chenille fabric cubes. Bamboo bowls filled with white beach sand topped with sea glass and shells. Vases with white orchid stems, and succulents nestled in oyster shells. Votive candles of varying height used for natural light. 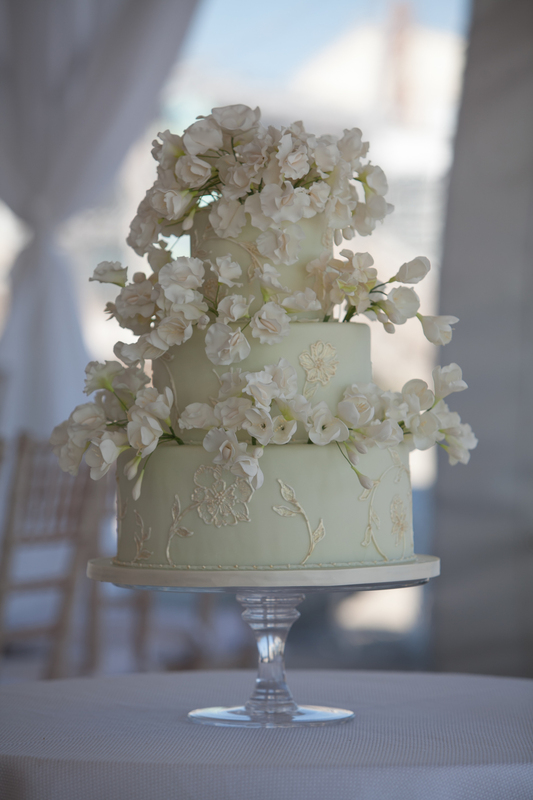 Three tier wedding cake made of pale mint green fondant with handmade all-natural sugar flowers. Cake design by Ana Parzych Cakes in Greenwich, CT.
A lovingly restored sea foam green 1967 Volkswagon bus converted into a rolling photo booth. Provided by Photo Booth Planet in Mystic, CT. Custom designed popcorn bags filled with artisan sweet chipotle popcorn. Provided by John Ginetti of 116 Crown in New Haven, CT.